I needed to buy a couple new rifle cases so I ordered a couple of the 42″ MOLLE Cases from www.cheaperthandirt.com. The price was reasonable, only $42.97 each plus shipping. Total cost to my door was under $100.00 for both cases. I am pleasantly surprised with these cases. For the price I wasn’t expecting much but I have to say I think they are well worth the price. I ordered one each in black and tan. I assumed they would only differ in color, but there are slight feature differences between them. 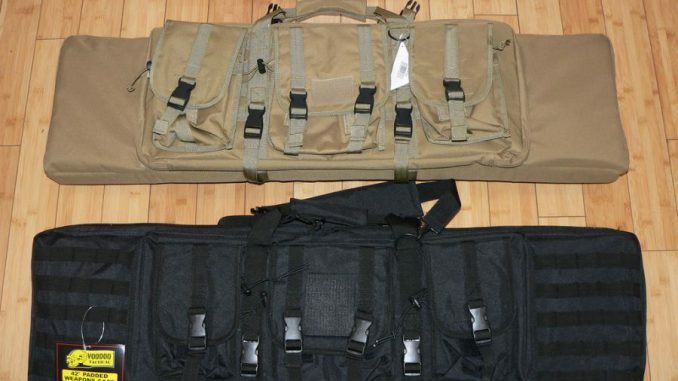 The black one is labeled as a 42″ Padded Weapons Case by Voodoo Tactical, while the tan one is labeled with the name Condor Outdoor. Both are identical on the inside, having both padded triangular corner pockets and velcro straps to hold the rifle. Both have three MOLLE style outer pouches mounted on a large, zippered, outer pocket, padded velcro carry handles, shoulder straps, and double-stiched zippers. The VooDoo Tactical case also has backpack-style straps, but the MOLLE pouches on the front are fixed. The VooDoo Tactical case also has additional webbing on the front to allow for a couple additional pouches to be attached. The Condor case does not include the backpack straps, but the MOLLE pouches are removable. I guess when ordering from CTD you cannot be 100% sure of which model you will receive but they are both very similar in features. If you really want the one over the other you may want to shop around and order one that is advertised as VooDoo Tactical or Condor, or at least call to be sure. There is penty of length in these cases for most AR style rifles. My rifle with the Magpul PRS stock and 20″ barrel fits fine, although it is a little tight in the height department. This rifle has an oversized target grip and a 44mm scope and the top of the scope is tight along the upper padding. If you have both an optic and a 30 round magazine (or 10/30 magazine) installed in your rifle it may not fit in these cases.